DISCLAIMER: THIS IS BOOK 3 IN A SERIES! MIGHT BE SPOILERY! READ AT YOUR OWN RISK! Jacinda was supposed to bond with Cassian, the “prince” of their pride. But she resisted long before she fell in love with Will—a human and, worse, a hunter. When she ran away with Will, it ended in disaster, with Cassian’s sister, Miram, captured. Weighed down by guilt, Jacinda knows she must rescue her to set things right. Yet to do so she will have to venture deep into the heart of enemy territory. Loyalties are tested and sacrifices made in the explosive conclusion to Sophie Jordan’s Firelight trilogy. The book starts out pretty much where the second book left off. Jacinda, Will, Cassian, and Tamra are setting up to rescue Cassian’s sister Miriam. She was captured by the ekros when Jacinda and Will tried to escape. Now, Jacinda must right the wrong before disappearing with Will into the sunset. To penetrate the stronghold of Miriam’s captors Jacinda must be captured herself. While at the facility, Jacinda meets other draki who’ve been held hostage. When the time for the rescue comes, all hell breaks lose and the gang must fight to survive. The chase is on, and no one will be the same when the dust settles. 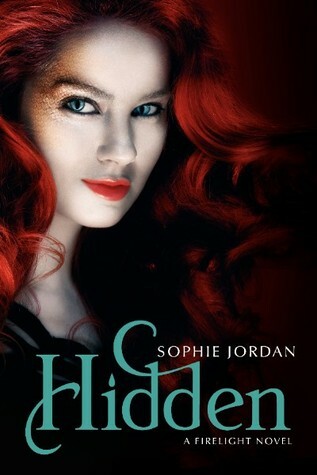 Hidden is a third and final book in Sophie Jordan’s Firelight series. I have truly enjoyed reading about Jacinda’s journey and Firelight is one of my favorite series. I really enjoyed the characters as individuals. Jacinda and Will’s love is one of my favorites, because no matter what they go through, they stay true to each other. Cassian is one of my favorite characters throughout the book. I like his complexity, I like his love for Jacinda, I like his heart. I have to say though I felt like Cassian didn’t get an ending in Hidden. There’s this part in the book where the characters discover something of Cassian’s and I honestly think the only reason he had was for Jacinda and that broke my heart. While I hated and loved him throughout the books, I wanted some kind of a happy ending for him. I didn’t feel like I got it. Tamra’s character was a fun one to read because she was so different in each book. I really enjoyed where Tamra ended up and her decisions in the end of the book. She really grew as a person and a draki throughout. Overall, Hidden was a great book, but like I mentioned earlier I wanted a better closer for the characters and I didn’t feel like I got it. I’m sad to say goodbye to a series, but I’m glad I got to read it! Sophie is one of my favorite authors, and I really can’t wait to read more of her stories! Hidden comes out September 11th, 2012! Get it, read it, love it! And let me know your thoughts! I am not familiar with this series but anything with Jeremy Renner in it and I'm in!! !